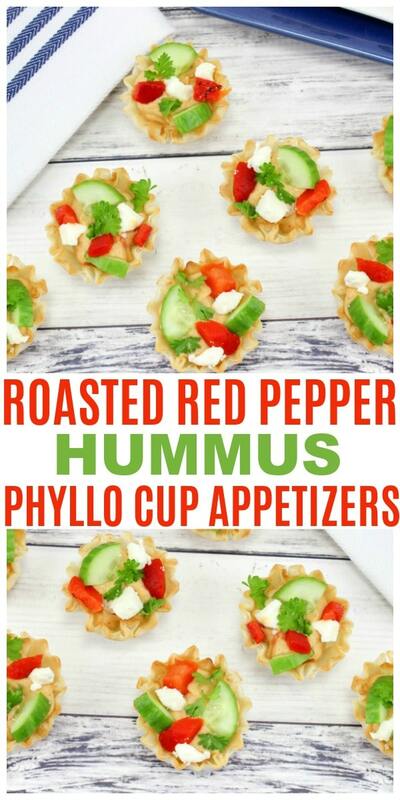 Roasted Red Pepper Hummus Phyllo Cup Appetizers are one of the easiest snacks you can make. 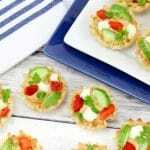 The best part is that these beautiful little appetizer cups are delicious and will be the hit of any party. I love recipes that work ANY time of year. It is also nice when it is a recipe that utilizes ingredients I typically have on hand. These Roasted Red Pepper Hummus Phyllo Cup Appetizers fit this criteria perfectly! We socialize quite a bit and with several kids still at home it is important that I make appetizers in large quantities. This simple appetizer recipe is very easy to double or even triple. I have made these delightful little treats for cookouts, birthday parties and many other occasions. They are always a popular food item. 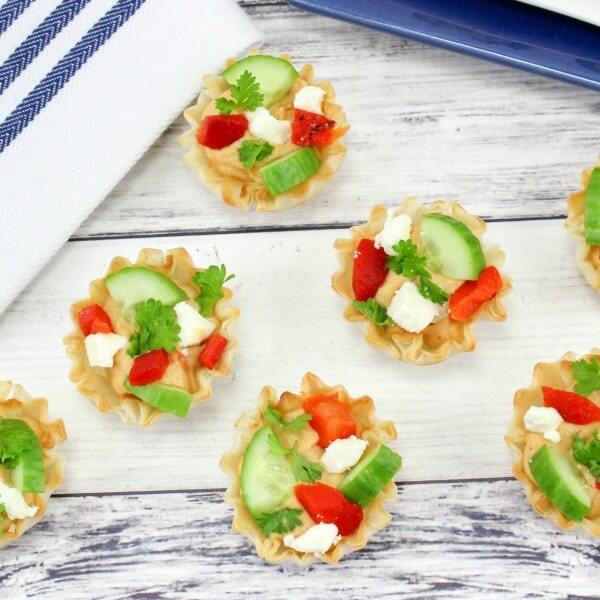 Some people think that phyllo cups are only for sweet treats. This is absolutely not true! 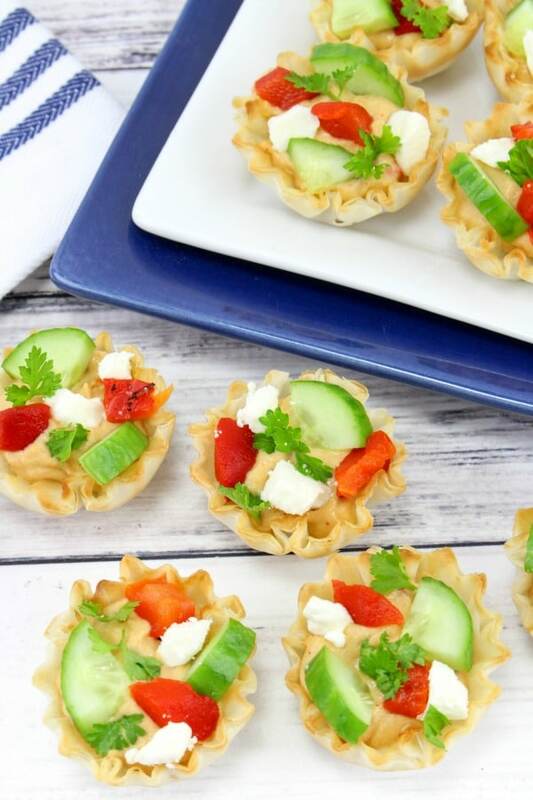 Phyllo cups are a very versatile food item and make life VERY easy! These are basically just light flaky layers of dough that have been formed into mini pastry cups. The dough ends up being light and crispy and tastes great sweet or savory. You can buy these little cups already made, baked and frozen. It is a great idea to keep these on hand at all times because you can thaw them out and fill them with almost anything for a quick appetizer. 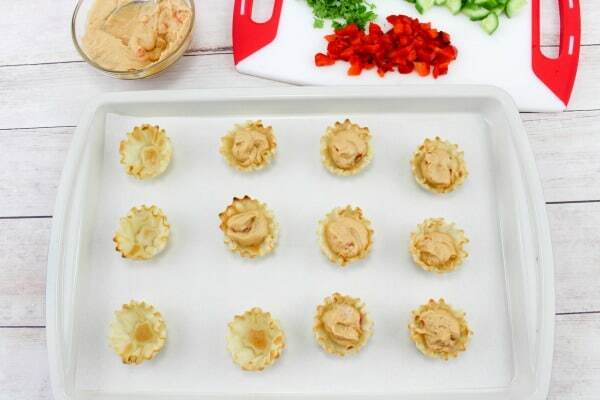 Another reason to use phyllo cups for these Roasted Red Pepper Hummus Phyllo Cup Appetizers is because they look beautiful on a platter! They are FINGER foods and people like the ease of being able to pick one up and pop it into their mouth in one bite. This recipe doesn’t require any cooking or baking and that always makes me smile. There is no need to heat up my kitchen at all. There are also only a handful of ingredients in this recipe. Easy Peasy! The first step to making Roasted Red Pepper Hummus Phyllo Cup Appetizers is to chop the veggies. 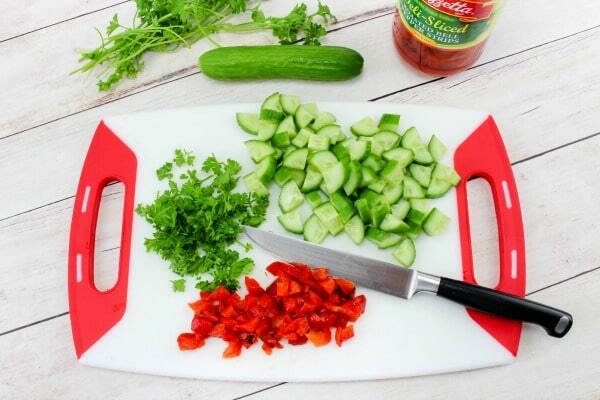 Chop up the roasted red peppers and the English cucumbers into very small pieces. I left the skin on the cucumber, but you can peel them if you prefer. Cut the fresh parsley into small pieces. Set the veggies and parsley aside for now. Now it’s time to fill the phyllo cups with hummus. I felt like the roasted red peppers needed some roasted red pepper hummus. You can use any flavor of hummus you want for this recipe. Fill each phyllo cup about 2/3 of the way with hummus. 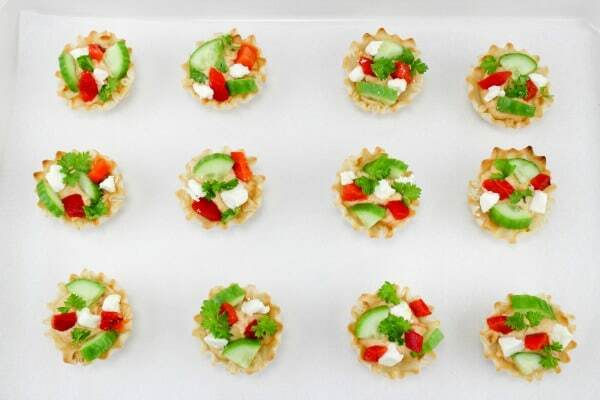 Sprinkle a few bits of roasted red pepper, cucumber, feta cheese and parsley on top of each phyllo cup. Now it is time to serve and enjoy! These are best made and served immediately. The phyllo cups can get a little soggy on the bottom if they sit for too long with the hummus in them. 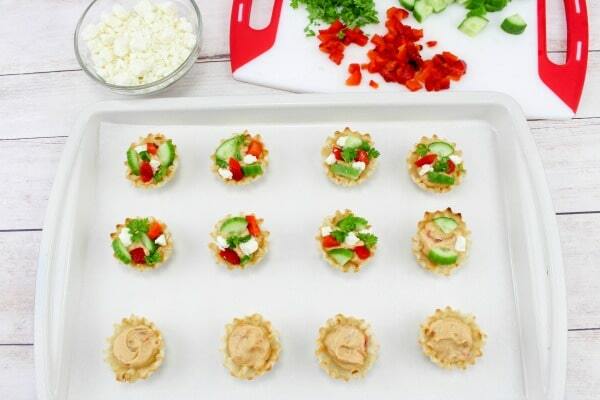 Are you ready to make these adorable Roasted Red Pepper Hummus Phyllo Cup Appetizers? You will find the exact recipe ingredients and directions below on the downloadable recipe card. These Roasted Red Pepper Hummus Phyllo Cup Appetizers are so easy to make and they look beautiful on a platter. Place a few pieces of cucumber, feta, and parsley on the top of the hummus. Be sure to PIN this Roasted Red Pepper Hummus Phyllo Cup Appetizers recipe so you can make it again and again!